"We're all looking forward to building on what was a very strong season last year"
The winger has suffered a series of injuries over the past four seasons and thought about giving up the game. However, his recent appearance for Worcester Warriors at the Premiership 7s has reignited his ambitions in the sport. “In all fairness, in about September time last year, I had almost hung up my boots,” Linney told TRU. “I was fed up with the constant injuries and I fell off the radar a little bit. “This year was about me enjoying my rugby and being back on the pitch again. Having had the opportunity to play for Worcester, I can’t believe how quickly I have gone from just enjoying playing, to now wanting to play as much rugby as I can do. Having impressed on the Sevens circuit with elite side Rambling Jesters this season, Linney was included in Worcester’s squad for the Premiership 7s. He made an instant impact for the Warriors at Franklin’s Gardens, helping them reach the Plate Final on Saturday evening. However, the Midlands club were narrowly beaten by Gloucester, but Linney admits he was pleased to finally experience playing in the competition. “It is something I have been really wanting to do for many years actually,” Linney added. “It was an absolutely incredible experience to play with so many talented players and it was an awesome step up in terms of development and the intensity. That is the sort of level you want to be playing at. “A message went out on our group at Rambling Jesters that Worcester were looking for a winger. I bit their arm off at the opportunity and spoke to Chim Gale. “He seemed keen to get me on board and fortunately, I have had a decent season on the Sevens circuit with the Jesters this year. “That was my first contact with Worcester. I have got a few friends who have been in the academy, but I have had a rough run over the last four years and I have not been able to play as nearly as much rugby as I would have liked to. 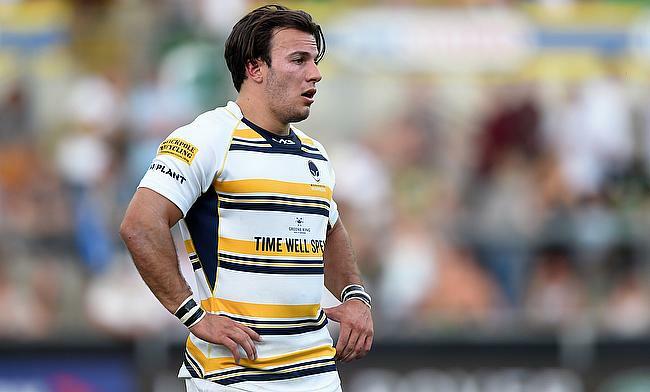 Linney is hoping that isn’t his final taste of top level rugby after his brief stint with Worcester, but his focus now turns to his National One side, Bishop’s Stortford. The winger has been associated with the club since the age of seven – in between a spell with Loughborough Students - and revealed the division is a good learning curve for any young player with aspirations in the game. He added: “I have been involved in National One since I joined Loughborough four years ago. It is an incredible league. It is bloody tough! There are lots of young boys who are experiencing men’s rugby for the first time and it is rugby of a high calibre as well. Linney is eluding to Stortford’s eighth placed finish which they achieved in 2017-18 during their maiden campaign in National One. Director of Rugby Andy Long has continued to take the club in the right direction and their policy of promoting youth and the addition of some new signings seems to be working. The men from Silver Leys begin the new season at home to last year’s runners-up, Darlington Mowden Park, on September 1st as Stortford aim to build on their progress. “Andy Long has done an incredible job and all the boys will vouch for that,” Linney added. “We made it into National One and I don’t think anyone expected us to go as well as we did. I was chatting to one of the boys and he was saying that a lot of the current guys, were with the club even before they were in National Two South. For Linney, he will be aiming to get more game time under his belt with Stortford this term. Balancing his work with rugby was tough last year, but the talented back is hopeful heading into the new season. He added: “I have gone from almost hanging up my boots at the beginning of the year to suddenly only wanting to pursue rugby so I really want to play! “I am doing a PGCE next year so I am not sure how much rugby I am going to be able to play on Saturday’s. “My hope is that in the second half of the season, I will be able to come in and make an impact. I am hoping the club and the school are going to be able to relieve me of some Saturday’s and give me as much time playing rugby as possible because it is now the biggest passion in my life."